Wow, we've got a fun challenge for you over at ABNH today, we've got a collaboration that I've had organised since, oh, February or so and I'm SO excited I get to finally reveal it. ABNH will be playing with the fabulous MAMA ELEPHANT this month! WOOT WOOT! Mama Elephant make such sweet, fun stamps, they're the perfect acoompaniment to Hero Arts. So after MUCH deliberation, because let's face it, all the Hero Arts Artists are inspiring, I went with my dear friend Lisa Spangler. I love love LOVE Lisa's look. It's hard to describe, but it's such a fun combination of (what I lovingly call) Granny Florals/patterns, next to super fun, modern (and sometimes neon) twists. Her cards are ALWAYS genius, but they look so organic and I just love them. She creates the most delightful cards, and seriously, I smile EVERY time I see them. AND if you leave a comment on our challenge post (this one on the 1st or the one that's coming on the 15th), you could win a Mama Elephant prize!! Thank you so much ladies at Mama E for being so generous! OK loves, see you again soon! I love how this background stamp complements the alphas on your sentiment perfectly! Such a pretty color combo, too! 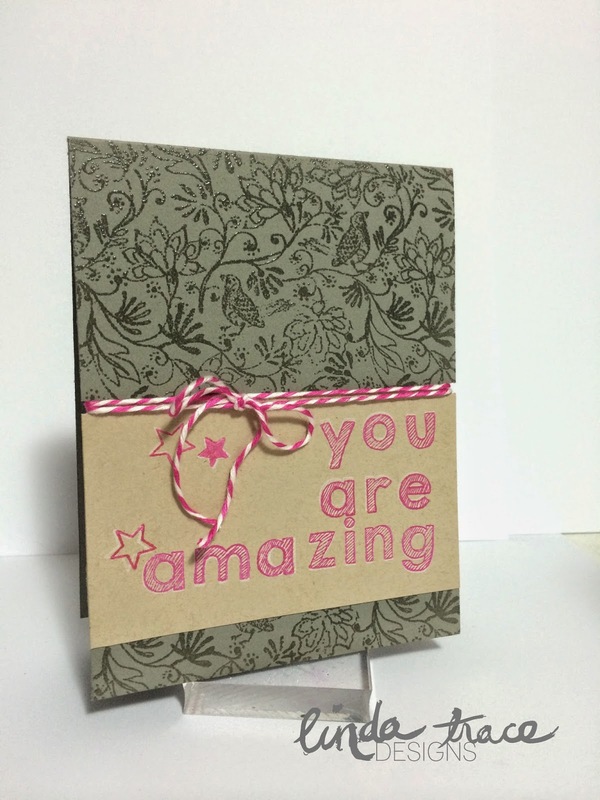 I think Lisa would be so pleased to see how you've nailed her eclectic paper crafting styles..beautiful card, Linda! Some Odd Girl meets Ruby Rock-It BLOG HOP!